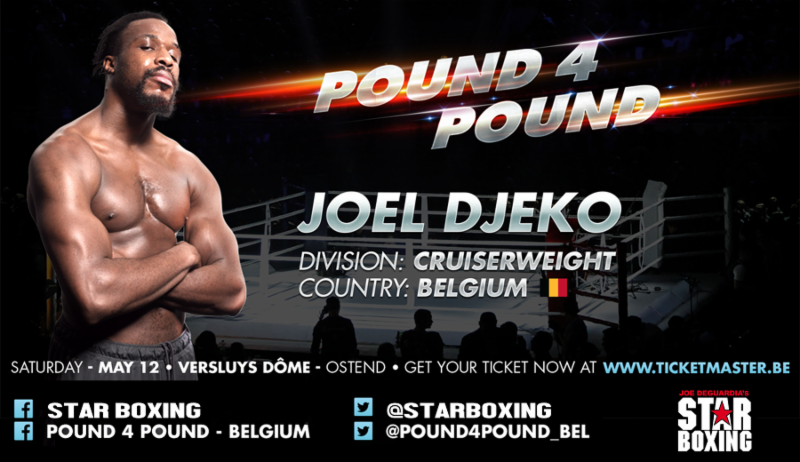 On Saturday, May 12th, Belgium cruiserweight sensation JOEL ‘BIG JOE’ DJEKO (12-2-1 7KO’s) will take on undefeated Argentinian, MARIANO ANGEL GUDINO (12-0 7KO’s) for the IBO CONTINENTAL CRUISERWEIGHT TITLE at the Versluys Dôme in Ostend, Belgium. Djeko is coming off of a dominate TKO performance over Tamas Kozma in his hometown of Belgium in September. Ahead of the May 12th tilt, Djeko went abroad to train in Cypress at the famous Touch Glove Gym. As a highly regarded prospect in the Cruiserweight division, Djeko knows that a victory on May 12th will not only win him a title, but will be the next step towards the ultimate goal of fighting for a world title. Djeko will look to use his massive frame, and quick feet to cut the ring off to attack Gudino. With seven KO’s in twelve wins, Djeko will certainly bring the power to the Versluys Dôme, on May 12th. The undefeated, thirty year old, Gudino, is currently ranked 39th by the WBC, holds the WBC Latino Cruiserweight Title and will be fighting in Belgium for the first time. This bout will have no shortage of power as Gudino has knocked out more then half of his opposition during his undefeated streak. As his first bout outside of Argentina, Gudino looks to use a victory to increase his global appeal. The Co Main Event will be a much anticipated fight for the Middleweight IBO Mediterranean title between two undefeated rising stars when, Danish, Landry “Hard” Kore (7-0 3KO’s) faces Armenian, Armen Ypremyan (8-0-2 3KO’s). Pound 4 Pound Boxing is presented by Maatala Production and Joe DeGuardia’s Star Boxing.